GMA Kapuso Foundation (GMAKF) once again received a monetary donation from the Philippine Canadian Charitable Foundation (PCCF), one of the biggest Filipino charitable organizations in Ontario, Canada to help fund GMAKF’s projects for this year. GMA Kapuso Foundation (GMAKF) once again received a monetary donation from the Philippine Canadian Charitable Foundation (PCCF), one of the biggest Filipino charitable organizations in Ontario, Canada to help fund GMAKF’s projects for this year. The annual turnover was led by PCCF Executive Vice President RosemerEnverga (fourth from left) together with GMAKF Founder and Ambassador Mel Tiangco (fourth from right). Also present last January 18 were (From left) GMAKF EVP and COO Rikki Escudero-Catibog, Miss Teen Philippines Canada 2018 Alexa Grant, Little Miss Philippines Canada 2018 Samantha Sarmiento, Miss Philippines Canada 2018 First Runner-up Ashlyn Velecina, Miss Philippines Canada 2018 Ranielle Macapagal and Mrs. Philippines Canada 2018 Elvira Ortiz. Every year, key members of the organization provide financial aid to their beneficiaries in the Philippines. 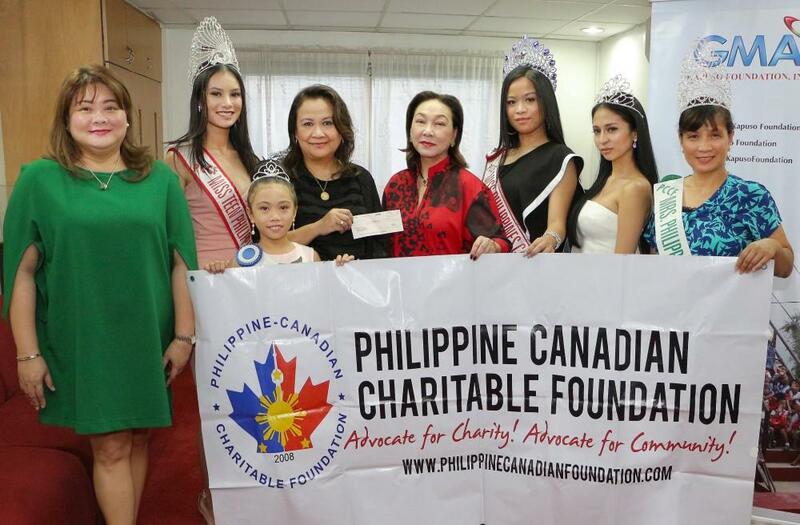 The donations come from proceeds of their various fundraising activities in Canada such as Pinoy Fiesta Toronto which showcases Filipino beauty, values, and culture. To donate to GMAKF, visit www.gmanetwork.com/kapusofoundation.